When only one team is playing offense and only one team is playing defense, it breaks the definition and purpose of the game. After all, how can it remain unique and consistent by somehow still having both teams simultaneously play offense and defense at all times, even during situations where they may not be doing it all the time? Removing a jammer from gameplay creates this paradox, introduced into the game in the form of the power jam. 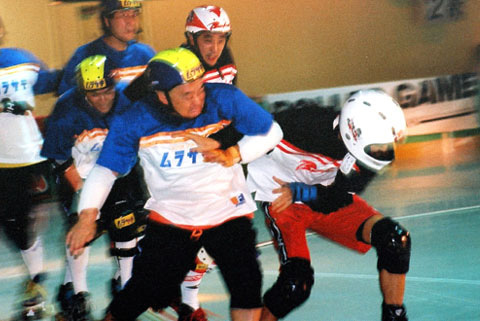 A relatively new phenomenon in the history of roller derby, one-jammer gameplay was first developed and fully realized in the late 1980s—some six decades after the creation of the game itself— in the form of Roller Game Japan. The game Hiroshi Koizumi invented was engineered to be nothing but power jams, a complete flip-flop from traditional roller derby which, until then, had been nothing but regular jams. This distinction is extremely important in understanding how things change when only one team has an offensive presence during gameplay. As we learned in the previous chapter, roller derby was designed for both teams to have a constant offensive threat the opponent was forced to engage, lest they would face consequences for not doing so. But with only one team able to score in a power jam situation, one (or both) teams will suddenly lose part of the “engage, or else” property that makes roller derby, or any other sport, work smoothly. If there’s no “or else,” there’s no guarantee of engagement. Such is the problem with power jams. For example, we know that killing a power jam, the team without the jammer (the defense) will want to avoid being scored on. Without a jammer on the track to help score points, they would have no reason to want to slow the pack or block offensively, and every reason to want to sprint the pack forward. However, if you force them to engage within a restricted pack2, this would allow the offense blockers to gain advantage by disengagement instead—i.e., slowing down the pack to a standstill without blocking the defense. In order to force the offensive blockers to engage, you’d need to add back in a consequence to the offense for failing to do so…like allowing the defense to sprint the pack forward should they get to the front. Trying to make a game 100% fair and balanced during a power jam is like trying to play Whack-A-Mole. Addressing one area of concern only creates another one somewhere else. The trick with making power jam gameplay resemble regular gameplay, insofar as much as maintaining competitive balance, is to replace the consequences facing both teams in regular play (“we must try to score, or else they will”) with a different consequence. Ideally, these consequences would be absolute, but doing so in a one-jammer environment is very difficult seeing as teams no longer have the same goal during a power jam. More realistically, the consequences need to be sufficiently detrimental to a team as possible to prevent exploitation of the situation, even if that means affording a team exploiting it some kind of benefit at the same time. All of the major modern roller derby rule sets have completely different ways of handling the power jam situation, some better than others. We’ll take a look at the four methods these rules have employed for one-jammer gameplay scenarios in a little bit. 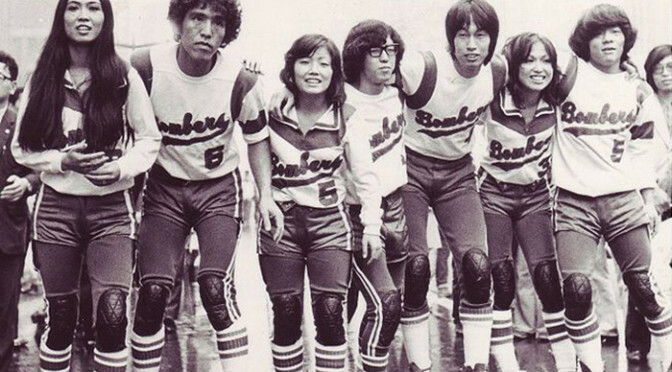 But being the form of the roller derby that invented the power jam, Hiroshi Koizumi’s Roller Game Japan may be the best first place look to reference how power jams can still force both teams to engage each other, even they’re both not playing offense and defense simultaneously. Roller Game Japan’s game format solves the potential problem of power jam non-engagement by forcing both teams to play offense and defense at the same time, even though only one team is on offense and the other is on defense. If that sounds impossible, you’d be right. So let’s re-frame the discussion: Change the definition of “offense” to that of attacking play, with “defense” meaning the containment or prevention of that attack. When an attacking team meets a defending team, you get engagement. The brilliance behind Roller Game Japan is how the defense is able to go on the attack, which simultaneously forces the offense to defend that attack in some capacity. This way, the offense must attack and defend simultaneously—or else—thereby restoring the engaging gameplay that makes roller derby what it is. There are two major components in the Roller Game Japan rules that make this work. The first is the lack of pack restrictions imposed on either team during a jam. Without the need for the defense to remain arbitrarily corralled nearer the other team, they can attack the offense with speed in an attempt to run away and avoid being scored on. If the offense wishes to score well, they must defend against this attack by engaging the opposition with positional blocks or big hits that will stop the them from getting too out of reach. However, the pitfall of this system is that should the defense completely get around the offense, players could potentially skate in circles endlessly. Happily, the design of the game naturally prevents this from happening by allowing offensive blockers to stop on the track and wait to re-engage. Even though the defense could also stop per the rules, it’s not to their advantage to do. It would just make it easier for them to get scored on. The offense, on the other hand, is never at risk of getting scored on by the other jammer—there is no other jammer!—so the defense will always have to contend with the offense no matter where they are on the track, either with the jammer coming up behind them or more offensive blockers coming up ahead of them. The second component gives the defense reason and incentive to want to engage the jammer. In regular roller derby, where two jammers are on the track and circulating, the “defense” (team that’s not lead jammer) has a small incentive to keep the pack speed under control—the sooner their scorer hits the pack, the sooner the jam ends via the other jammer calling it off or the better chance they have of stealing a few points. During power jams, without a jammer (or pivot) to give chase, this incentive disappears and the mindset switches to “don’t get scored on,” which in traditional rules entails running away from the jammer and getting around and away from the opposing blockers as quickly as possible. But RG Japan rules wave a juicy carrot in front of the defense, allowing them ability to stop the jam by driving the jammer out of bounds, among other ways. Making disappear a significant chunk of jam time and taking away the potential points the offense might have scored during it is worth attacking the jammer, especially early on in the jam when the blockers are tightly bunched up and will likely be scored on anyway. Seeing as this is a very bad thing for the offense to have happen to them, this threat therefore compels them to defend their jammer from these attacks with assisting blocks and whips to get them around and past the defensive blockers as quickly and as cleanly as possible. Together, these two components are how Hiroshi Koizumi balanced the unbalanced power jam situation. The offense must engage and slow the defense, or else they will not score many points on the jam. The defense has the ability to escape with evasion and speed, but the offense can corral it by waiting for the defense to come back around to re-engage, though that comes with the consequence of squandering potential points to do so. The defense can use this potential isolation to their advantage by engaging the jammer to force the jam to end early. Because of this, the offense will need to constantly engage the defense to protect their jammer, or else they may not score any points at all. The start of a jam in RGJL. Note how the inside start positioning of the defense (red) allows them to more easily sprint away and engage the jammer, by design. (A) The offense must engage players on defense to slow and score on them. (B) If they don’t, the defense can sprint away to prevent the jammer for scoring on them for a lap. (C) The defense cannot completely escape engagement, as the offense can stop to wait for them to catch up. (D) The offense must also protect their jammer from being blocked of bounds to keep the jam going. Importantly, all of these pieces are necessary to ensure engagement between the teams. If you take away the ability for the defense to sprint away, the offense will have no reason to engage and slow them to prevent them from doing so. If you take away the ability for the offense to stop on the track, the defense would be able to skate without ever having to re-engage. If you remove the ability for the defense to end the jam, the offense would have no incentive to directly assist their jammer. However, the most critical thing about this system is that the onus is completely on the offense, jammers and blockers, to act and engage. Though the defense has limited incentive to engage when they have to, they can only fairly do so if the offense has a similar incentive to engage them in the first place. Without a reason for blockers to engage each other, you’ll get a very dull and boring game. (That’s true whether the skaters are going fast or slow.) And the only way that reason can be created is to make the offense suffer the consequences if they don’t engage—whatever those consequences may be. The four major modern roller derby rule sets have different ways of inducing these consequences during power jams, although some are more successful than others in doing so. Let’s take a look at four of them. This is the perfect example of the absolute wrong way to tackle the power jam problem. A 10-foot (or less) pack proximity restriction, together with the provision that all blockers must disengage once that proximity is exceeded and no pack can be defined, is a recipe for trouble during one-jammer gameplay situations. To force engagement, the offense needs to suffer some kind of consequence for not engaging the opposition. Instead, the restricted pack/no-pack combination creates virtually no consequence to the offensive blockers for not engaging the defense. In fact, there are actually more detrimental consequences for choosing to engage rather than incentives to do so, because speeding up to attack the defense allows the defense a fair opportunity to defend their position against the solo jammer, a luxury the offense would never want to give to the defense. The “consequence” that this method employs in an attempt to deter non-engagement practices is the threat of penalties for deliberately destroying the pack or failing to reform it in a timely manner. However, these penalties are next to worthless in countering the enormous upside to doing it—a points bonanza. It’s an unfortunate correlation that games played under this format generally yield more points and more penalties than better-balanced games. This means the formula for the offensive blockers under Method 1 is “we must disengage the defense or else we won’t score many points,” which is completely backwards to how it should be. This method just goes to show that just because game design works okay during regular gameplay, that’s no guarantee it will also work during power jam gameplay. Ultimately, a game should first be built around situations where only one jammer is on the track, then tweaked to make sure the game also flows well with two jammers (or no jammers) as well. The evolution of this design shows exactly the benefit to doing this. The power jam problem that modern roller derby loopholed itself into was giving the offense an advantage to disengage. One solution to this problem gets rid of much of—but not all—of this incentive. The result is that the offense is much, much more likely to want to attack the defense, thereby creating the elusive engagement we’re after. But first, let’s be honest with ourselves: A lot of players in roller derby are good, but most of them aren’t yet. Many can’t do much more than turn left when going at top speed, meaning a faster game would make it very difficult for inexperienced players to do anything other than be rolling roadblocks. While the high pace of traditional roller derby (or Roller Game Japan, for that matter) makes derby exponentially more exciting, the reality is that in the current state of derby’s growth, incorporating the speed element would be beyond the skill level of many players and teams. Then again, most players and teams can actually do things when they’re skating at a comfortable pace. Method 2 induces offensive blocker engagement in a way that allows for that pace to exist. Like with Method 1, a restricted pack proximity distance (5 feet in this case) means teams are required to stay near each other under normal circumstances, and penalties still exist for failure to maintain that proximity. This compels the offense to assist their jammer, since leaving them alone against a wall of defensive blockers will make it very unlikely that they will score good points on the power jam. The only other way to get their jammer out would under these circumstances would be to trap a defensive player behind or clear the way at the front. Either way, it requires engagement. Making the offense engage the defense naturally puts some pace in the pack, and therefore allows the defense a fair opportunity to block and defend against the jammer. (You can see an example of a power jam employing this method here; compared to the above example, it’s a night and day difference.) However, this method isn’t perfect, because should the offense fail in their attempt to engage the defense they know they can slow the pack (or at least prevent it from speeding away) by disengaging, forcing the defense at the front to slow to reform the pack. So for Method 2, the consequence for the offensive blockers is “we must engage the defense or else we may not score many points…but at least we can curb the speed of the pack by disengaging.” Needless to say, this is a massive improvement over Method 1. For where modern roller derby is right now, it may well hit the sweet spot of competitive balance, game fairness, and fan engagement within the current level of play. However, there may be yet a better way handle power jams, particularly if there are individuals out there that feel derby can go to yet a higher level in the future. In Method 1, there was no pace in the pack. In Method 2, there was significantly more pace in the pack, but it could be slowed without engagement. For roller derby to realize its full potential, the element of speed (or better said, the potential of speed) must be just as important as a factor as that of strategy or physical contact. This must be true during power jams just as much as it is during regular jams, and Method 3 shows what happens when speed becomes a major factor in the equation. In Method 2, the offense is compelled to engage because they must break through the defense in order to score, although pack proximity restrictions gives them an “out” which allows them to temporarily disengage and slow things down to reset to try again. In Method 3, the offense is compelled to engage because they must contain the defense in order to score. Should they fail, they don’t have an out; they won’t score at all. Period. This is because in such a situation, there is no pack proximity for the defense to remain restricted to, so they need not be slowed artificially. Instead, they have an opportunity to earn the right to make the pack go as fast as they want—exactly what the offense doesn’t want to have happen while on the power jam. This method is the most similar to the framework that Roller Game Japan uses during its power jams, though there are two important distinctions. First, the offense can’t just stop or slow on the track and wait for the defensive blockers to come back around. Doing this would be confusing for when the power jam ends and the other jammer returns to the track. Trying to track which blockers are on which lap for scoring purposes or reforming the pack in general would be very messy. However, this scenario is naturally curbed by the way the defense is afforded a way to end the jam prematurely, like in RG Japan. But unlike RG Japan, where this can only be done by defensive engagement on the jammer, this Method 3 uses indirect, disengaging techniques to achieve the same effect. 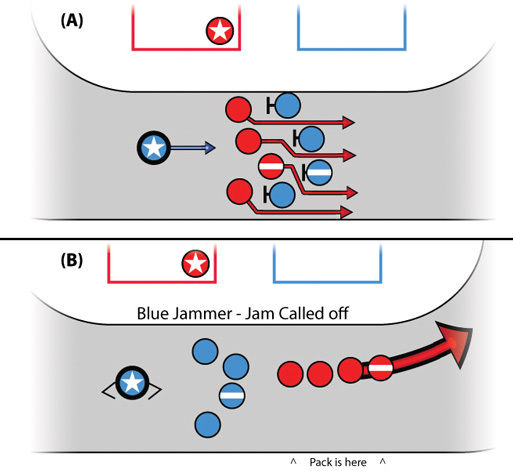 Basically, once the defense defeats offensive blocker containment and speeds the pack away, the jammer has every incentive to use their lead jammer status to end the jam immediately, in an attempt to save as much remaining power jam time as possible for another try at it in a new jam. This, therefore, prevents the issue with the pack lapping itself from being a major problem in the first place. In Method 3, (A) should the offense suffer the consequences of failing to maintain engagement, the defense could potentially run away with the pack (and not need to engage) indefinitely. (B) However, the offense has the power, and every reason to call off the jam, making such an indefinite pullaway extremely rare. Even still, there are two problems with this. The first is obvious: If the solo jammer hasn’t completed their initial pass, how can they call it off to stop the runaway? But more importantly for the problem with power jams: The defense has no incentive to engage the jammer, even if the offense has incentive to want to engage the defense. All the defense wants to do is not get scored on; engaging the jammer during a power jam, especially if they’re in a scoring position, is not wise if they know it needs to be done for the whole length of the jammer penalty. Despite this, Method 3 introduces a much more severe consequence for the offense to force them to engage the defensive blockers: “We must engage the defense or else we definitely won’t score, and we’ll waste precious seconds of power jam time.” There’s absolutely no benefit to the offense to disengage here, although that comes at the cost at giving the defense a benefit to disengagement—though not without working hard to earn and maintain the ability to benefit from it. This is in stark contrast to Method 1, where the offense can benefit by not working hard at all. In all the previous methods for tackling power jams, there is always an avenue for one team or the other, mostly the offense, to somehow benefit by not engaging their opponents, even if that benefit is temporary or minor. But some are better than others in forcing a team to engage, using the consequences for failing to do so as motivation. Still, roller derby is a game where both teams play offense and defense (or attack and defend) at the same time, all the time. Yet all of these methods have situations where one of the teams don’t do it all the time, still presenting the original problem. So why not nip the power jam in the bud by effectively getting rid of it altogether? Roller derby rules designed to have an active pivot—one who can break and chase after the opposing lead jammer—essentially eliminates the potential problems the power jam brings to roller derby, reverting things back to the balanced game it was originally designed to be in the first place. Even if one team (or even both teams) has their jammer in the box, since both will still be fielding a scoring threat, both teams will have to engage in order to prevent the other team from gaining an advantage and scoring points. The only wrinkle in this situation is that the team with the penalized jammer cannot possibly earn lead jammer status on the initial pass. This still gives the team with a jammer a significant advantage, but only if they engage the opposition and maintain that advantage. Because the moment they try to disengage, there will be consequences: The chasing pivot could escape the pack quickly and force the lead jammer to call off the jam early. Or worse, they could lose lead status entirely should they be passed. As such, this makes the consequences for the offense plain and simple: “We must engage and try to score, or else the other team will.” Since both teams are on offense, this method just about guarantees both teams will attack and defend at all times. And it’s at this point a designer of a game has a decision to make. Just how watertight does set of roller derby rules to be, so as to 100% absolutely positively guarantee that no team can loophole their way, however briefly, to any kind of advantage whatsoever during power jams? Is it even necessary at this stage of roller derby? Will it ever be necessary in a top-flight roller derby league? Do these questions necessarily have a right or wrong answer? No, they don’t. And that’s the true answer to the power jam problem. As the modern game still struggles to come to a consensus—or at least an agreement to disagree on a consensus—on how roller derby rules should handle the power jams (not to mention everything else), there are ultimately three guidelines on how to proceed with them. The first and most important one of them all: There is no perfect solution to retrofit one-jammer gameplay scenarios into a game designed for both teams to have a scoring presence on track at all times. While some solutions will be more perfect than others, there will always be small snags or loophole-type issues that some may believe don’t belong in the game. If we are to accept that there will always be the potential for problems during power jams, the next goal is to ensure there are significant consequences for the offense during power jams to induce engagement between blockers on both teams. These consequences can take the form of significant and meaningful penalties, loss of rights or status, or (preferably) the reduction or elimination of scoring opportunities. No matter what they are, they must be there, or else you’ll have the equivalent of basketball without a shot clock. Finally, given that these consequences will undeniably create an situation where disengagement may be advantageous for one team or the other, attempt to make undesirable effects have fair counters and/or happen extremely rarely. For example, if the pack running away at speed is happening frequently, this can be tempered by allowing the other team to counter it with a jam call-off, or made to happen rarely by adding an active pivot to the rules. If derby rules makers can understand these three points, problems with all roller derby rules, not just power jams, will take care of themselves. Hiroshi Koizumi understood these fundamentals when he invented a completely new way to play roller derby, which is why his rules are the most complete power jam rules that exist today. However, that comes at the cost of not having regular jams—but if that’s what it takes to make something like Roller Derby Japan fast, exciting, and engaging, maybe that’s a snag worth having to live with. The fact that a team must play offense and defense simultaneously isn’t unique to roller derby—only that it happens all the time. There are sports where, in a way, teams play offense and defense simultaneously, but only some of the time. Part 6 of this series will explain the simultaneous offense-defense dynamic and how it affects sports in general, including roller derby. For the rules nerds: What RDCL has done for its 2013 rules is to guarantee (there’s that word again!) that there is always an engagement zone on the track at all times. When no single group meets pack definition, a “split pack” is declared and an engagement zone is defined from the foremost blocker on the track, back 20 feet, until the pack is reformed again. (Both teams still have a responsibility to reform the pack.) Because there is always an engagement zone, all players in it may still block—and the jammer can no longer get by for free.